China is entering new stage of economic and societal development which we call China 2.0. An era that is characterized by China’s diminishing low-cost advantage and increased competition by local Chinese firms. China 2.0 may prove painful for those managers and western companies that are not prepared for this new reality. Businesses that are slow to adapt will struggle to remain successful or could even be forced to shut down their operations. Succeeding in the China 2.0 era will require managers to reposition and reorganize their businesses, a process that needs to be based on a thorough reassessment of their current knowledge. This is especially true with regards to China, which, due to its rapid development is already a much different country than it was portrayed to be only a few years ago. 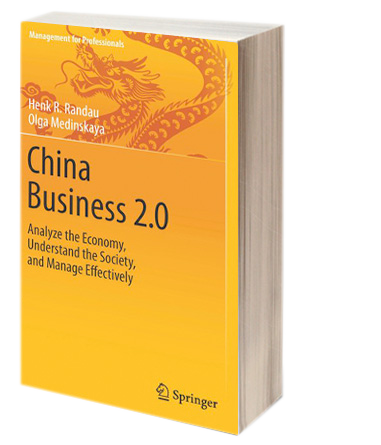 CHINA BUSINESS 2.0 is intended to assist managers in updating their knowledge in relevant business areas. The book covers more than 40 key issues on understanding China from an executive’s perspective. Inspired by our experience in doing business in China, Henk Randau and Olga Medinskaya present each topic in a compact format suitable for time-constraint executives. 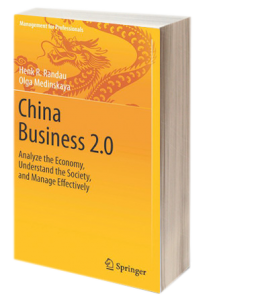 To enhance practicality CHINA BUSINESS 2.0 contains also 50 helpful, concise ‘tips’ and ‘warnings’ in separate boxes and added ‘suggestions for further reading’ at the end of several chapters. CHINA BUSINESS 2.0 also includes 15 valuable ‘insight’ sections in which top executives and consultants give first-hand advice and share their opinions on the future trends of highly important topics. All of these experts have lived in China or have had major exposure to the country and possess real on-the-ground experience.